A huge proportion of people now login regularly to Facebook - but how do you turn those users into likers on your Facebook page? If you have a business or website, chances are you want to get as many people to notice it as possible. Facebook is a great place to do that - but just making a page and letting it sit there won't get you noticed and it certainly won't make you money. 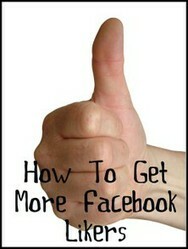 Here are some tips for getting people to like your page - both paid and free methods! Advertising. This means your page logo and a short informational sentence is displayed by Facebook randomly on people’s accounts. You can choose what people you want to display your advert to, by age, location or other factors including interests. Advertising this way costs you money for each click. Facebook recommends that you pay about 55 cents per click but in my experience it’s still possible to get clicks for much lower - experiment and see what works. Competitions. Just make sure you follow the Facebook rules - you need a separate app and a Facebook disclaimer. Reciprocal shoutouts. Use the @ sign to link any other page you want to send a shout out to. Let your followers know that you like a certain page – and if you network with enough similar pages, they can send shout outs your way too. Do regular updates. Don’t spam pointless updates all day. But do at least one update every day or two so people remember you. That way, they’re more likely to return as well as more likely to tell a friend about you if their friend mentions the topic that your page features. Have an attractive logo and cover photo. The best size is 200x200 pixels and cover photo is 850x315. Use a logo that grabs attention and preferably lets viewers know what your page is about. Use a cover photo to tell people a little more about your business. Don’t be afraid to promote. Now and then, it’s fine to link to a page where you are selling a book, or asking people a leading question such as “If you could buy [item name] for anyone, who would you buy it for and why?” Also a good way to do some quick market research! Post at ‘peak times’. Users are online more often at certain times of day. To get the attention of the majority of Facebook users, try and post in the early to late evenings. You can also use statistics (see below) to find out when peak times for your page are. Use Statistics. Your page has a wealth of statistics available, both directly under updates you make (it takes about 48 hours to show up) and in the ‘Edit Page’ area. Statistics will tell you whose interest you are getting (male, female and age groups). They’ll also let you know how many of your followers are actually seeing or interacting with your updates. Make it shareable. Make sure that photos you post and updates you make aren’t just dry and boring. Make them interesting, funny, pretty or unique – that way people are more likely to want to reshare them and you increase your chance of someone new seeing your page name. Advertise your page on your website. Let people know that you’re on Facebook. Link to your page and let them know that they can get regular updates when you make new posts or you have news or competitions. Allow check-ins. If you list your business street address, people that visit you can "check in" to say they've been at that location. Their friends will see that they've checked in and may come visit your page. Thanks, I have a fan page and will implement some ideas for my Made in USA page.